Since its October 28, 1886 dedication, the Statue of Liberty has proven a celebrated symbol of freedom and opportunity. 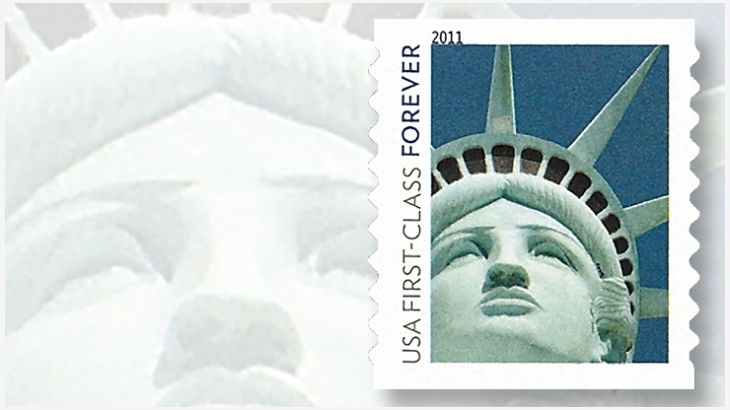 Come Sept. 11, artist Robert S. Davidson intends to argue that the United States Postal Service (USPS) improperly extended those concepts to its benefit by using his sculpted rendering of the iconic work on more than four billion stamps, with roughly a quarter of the prints issued even after the entity had learned it was not the original New York City masterpiece. For 21 years, the disputed artwork has stood outside the Las Vegas-based New York, New York Hotel & Casino, with Davidson devising it, he contends, not as an attempt to duplicate the Statue of Liberty exactly but rather as an effort to make a piece that features a “more fresh-faced,” “sultry” and “sexier” version. In trying to paint USPS as a lawbreaker, he is litigating a matter that stretches back seven years. Despite having the information on its faux pas, the agency printed 1.13 billion additional stamps, swelling the total to almost 4.63 billion erroneous items. Now, four years after he sued the mail provider, Davidson will look to brush aside the contention that his brainchild is not a unique bit of handiwork. What adds to the mix is that the USPS continued to market the incorrect artistic impression, with a spokesman saying in 2013 that the design proved so popular that his employer “would have selected this photography anyway.” However, another official responsible for stamp designs contended that he would never have made the in-question selection had he known it featured a replica. We are exactly one month from the liability-and-damages trial in the nation’s capital, so expect the next 31 days and the litigation process to include ample mentions of “copyright infringement,” “fair use” and “public domain.” It remains to be seen, of course, whether Davidson carves out a fruitful future through the matter, which, interestingly, has a precedent. In September 2013, a federal court judgment ruled the USPS had to pay a sculptor $685,000 after not acquiring permission to use his Korean War Memorial design on, of course, a stamp.